Earlier today, I was disturbed about an article posted on wamda about East Africa’s hottest Tech Hubs. I was looking for technology news in East Africa and when I saw the hottest tech hubs, I jumped on to it thinking our very own hubs are featuring there. To my disappointment, none featured! 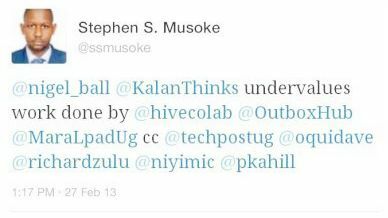 I wondered why Jonathan Kalan (@KalanThinks) — the author of the article missed Uganda and I realized a lot of the technology related news here is not shared or not easily available. Plus maybe we are not yet recognized as making an impact in the tech world yet. Mara Launchpad – is an entrepreneurship centre in Kampala, Uganda. Its existence is to provide young businesses in Kampala professional office space at an affordable rate of Ug Shs 300,000 as well as fostering a community of like minded people. The centre is located at Ham Towers in Kampala City Centre, adjacent to Makerere University.The space has an open-plan layout with modern furniture befitting the professional image required by ambitious young entrepreneurs. Members are able to make use of a fast wi-fi internet connection, lounge area, conference room, and the professional touch of having their guests received by a receptionist. In addition to the core shared office service, Mara Launchpad runs a speaker Programme and hosts many external events of much relevance to entrepreneurs. The speaker Programme brings keynote speakers to talk to entrepreneurs on technical issues such as taxation and capital. The Young Entrepreneur Club meetings and the entrepreneur Launchpad mentorship Programme also take place at the Mara Launchpad. Recently it hosted a biz hackathon, an event that brought a number of innovative individuals to develop products, services and business solutions that solve challenges which face Ugandan people. Oh by the way, the TechPost offices are also located at this center. You can read more about it here: Marabizhack. Hivacolab – is an innovation hub, community owned, collaborative, co-working space for the Uganda’s Technology community. It is an open space with a focus on young Tech entrepreneurs, web and mobile app developers, designers, Investors, VCs and donors. It offers Open space for free to all developers and Tech entrepreneurs once they become a member. The only requirement is that you are working on a project or are looking for a project to work on one. This was the first Tech Hub in Uganda collaborating with academia and private sector to inspire this and the next generation of Ugandan Technologists to build and develop apps, guiding youth into creativity and innovation to produce quality and world class technology. Located in the outskirts of Kampala on the 3rd floor of Kanjokya House in Kamwokya, thus making it easy for members to access. It has a 155 sq. mtr space, reliable Internet connection, and electricity back up, conference space for one to one meetings, tech atmosphere to share the latest trends in the world of Technology. Outbox – is a technology incubation, collaboration space and innovation hub that supports technologists. It offers support for people to turn their tech ideas into sustainable businesses. The mission is to create awesome products and businesses based on the mobile and web platforms that create value, relevance and are sustainable. They offer co-working/ incubation space for young tech businesses and Mentorship, Innovation competitions facilitation, Industry workshops and meet up space rental, Networking and investor sourcing, Access to professional service. They are located in Kampala on Soliz House Nakasero, Lumumba Avenue. Microsoft Innovation Center – these were rolled out as a means of accelerating students to Jobs, Ideas to Innovations, and Innovations to solutions and Solutions to companies. The Microsoft Innovation Centers (MICs) are local government organizations, universities, industry organizations, software or hardware vendors that partnered with Microsoft with a common goal to foster the growth of local software economies. One of these is located on 6th floor, CoCIS Block B, Makerere University, Plot 5, University Road, Kampala, Uganda. This center carries out activities like Imagine Cup competitions, Student to Business program, Business Skills Development, Technical Skills Development, Business Incubator / Startup Incubation, Microsoft IT Academy, Developer Camps. I hope this is helpful to any one who did not know about these hubs.